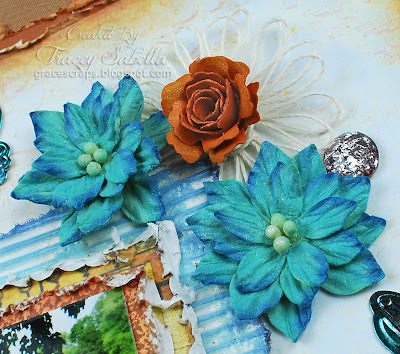 Hi, it's Tracey here to share a Father's Day card featuring twine flowers along with a tutorial to create these versatile flowers. 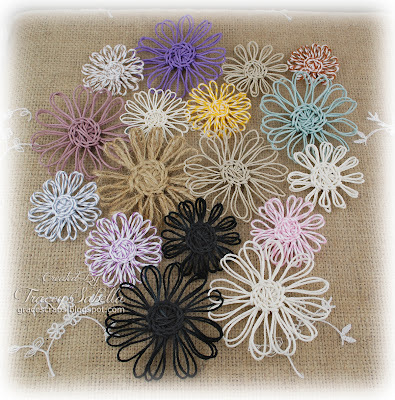 Bonnie carries a huge variety of twine and cording perfect for these flowers!! 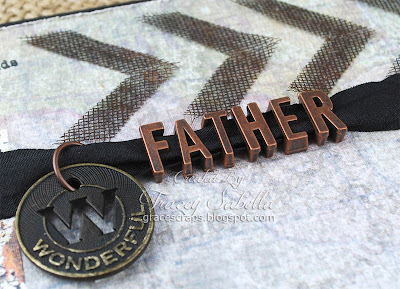 Father's Day is such a special day to celebrate!! Especially when I have a faithful, loving father who has always been there when I need him. 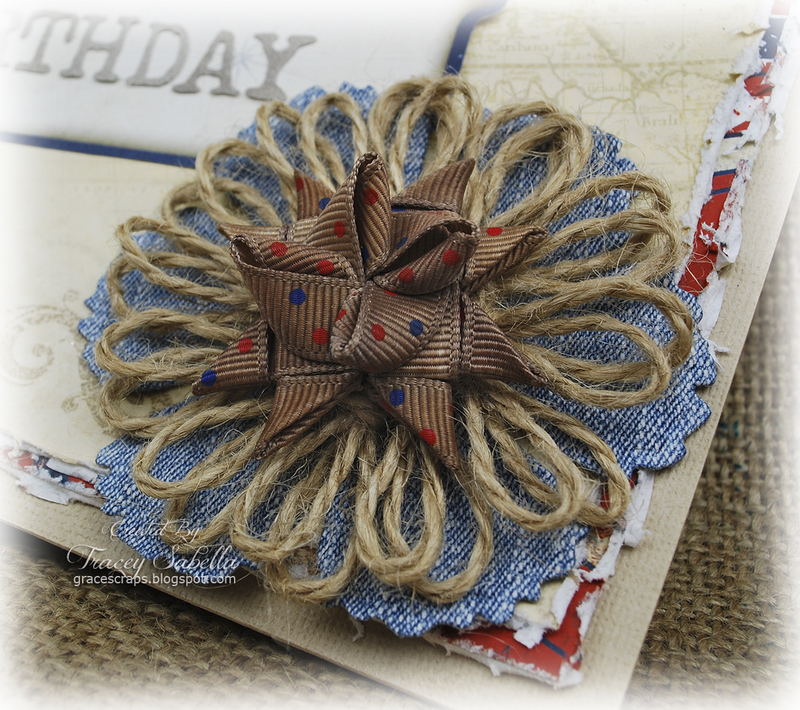 Twine Flowers ~ These are created with 20lb Hemp Cord and Baker's Twine. The smaller flowers are centered with Newsprint Candi Minis. 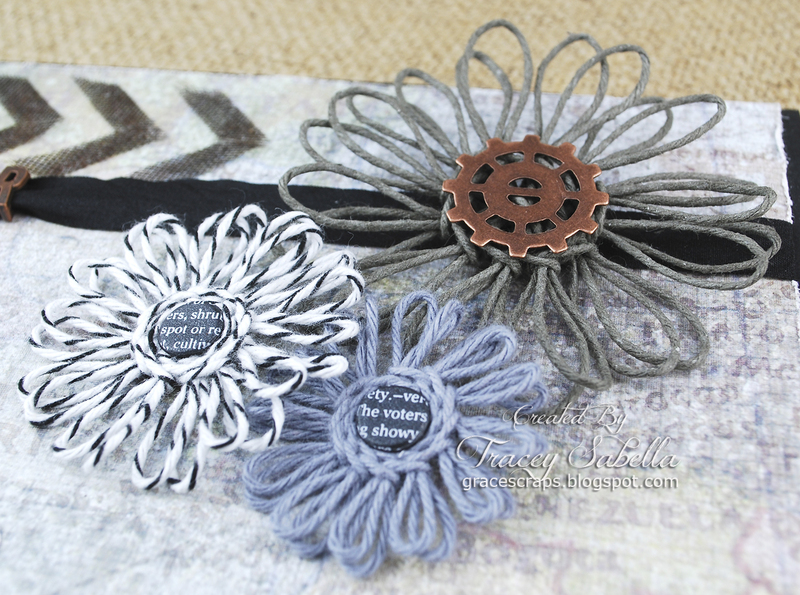 Scroll down for my Twine Flower tutorial. Title ~ These ribbon slide letters for "father" were so perfect to use with the 1/2" Black Wrinkle Ribbon. I used a Tim Holtz Muse Token for the first part of the sentiment and sanded the raised portion to help the letters pop. Chevrons ~ I collect crafty odds and ends including a small roll of rusty wire mesh. I cut a piece into these grungy, masculine chevrons. 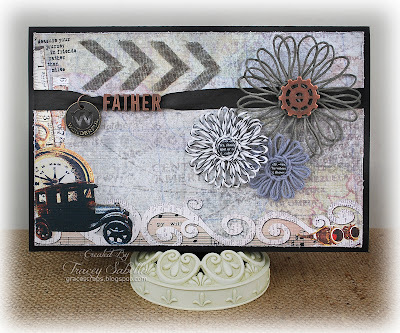 The gorgeous masculine paper is from the Donna Salazar Antiquities collection 8" x 8" pad. Last year I noticed some gorgeous twine flowers on Pinterest, however, was unable to locate detailed instructions to create them. After quite a bit of experimenting and honing, I came up with this step by step tutorial for you to recreate some as well. 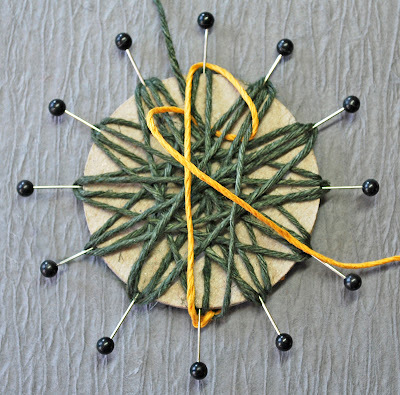 I am reposting my tutorial here along with some updated information I've learned after a year of making these beauties and at the bottom of this post you will find a Twine Length Guideline Chart as well. Please don't be intimidated by the number of steps. I wanted to make sure the directions are clear, so I would rather err on the side of giving you more information than you might need. The tutorial I learned from had fewer steps, and I found myself doing some trial and error, that hopefully will be avoided for you. Once you have made your loom and have a couple flowers under your belt, these little beauties only take about 10 to 15 minutes each to create. I like to make them when traveling in the car with my husband or catching a television show in the evening. 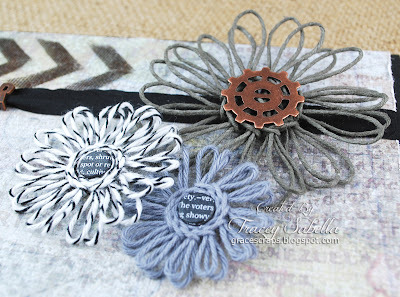 Here are some project examples of twine flowers created with Really Reasonable Ribbon products. b) Two same size chipboard circles ~ I used 2 inch circles. 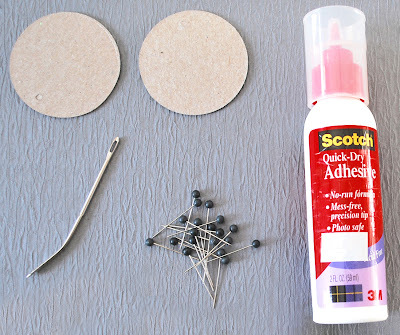 c) Glue ~ any kind of glue that will hold the two chipboard circles together will work. I used Scotch Quick Dry Adhesive. ** Update ~ White glue like the Scotch Quick Dry Adhesive works better than clear glues which stay somewhat tacky and make pushing the pins in and out more difficult. d) 12 Straight pins ~ Mine have plastic balls on the ends, but any pins you have will work or even small finishing nails if you don't have straight pins. 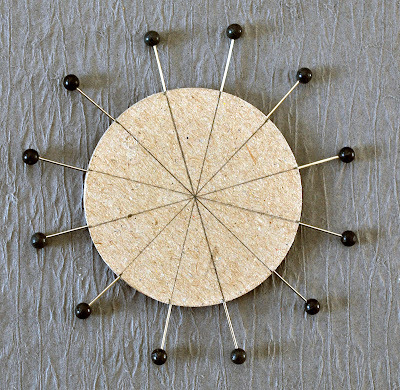 ***Update*** While flat head pins will work, The round ball ends are much easier to work with, and there is less hand fatigue when using this kind of pin. 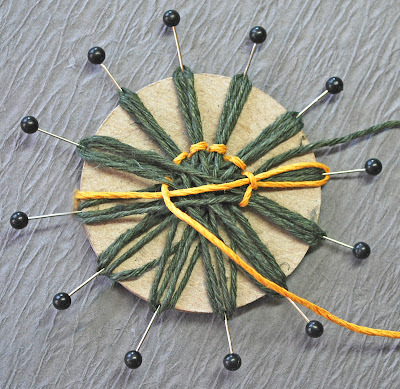 e) Large eye tapestry or yarn needle The needle doesn't have to be flat on the end with a curve like mine, as long as the eye is large enough to thread the twine and a rounded rather than sharp pointed end, it will work. The blue plastic yarn needles also work. f) A pencil or pen and ruler (not pictured) is needed to draw lines on the top circle. Step 1. 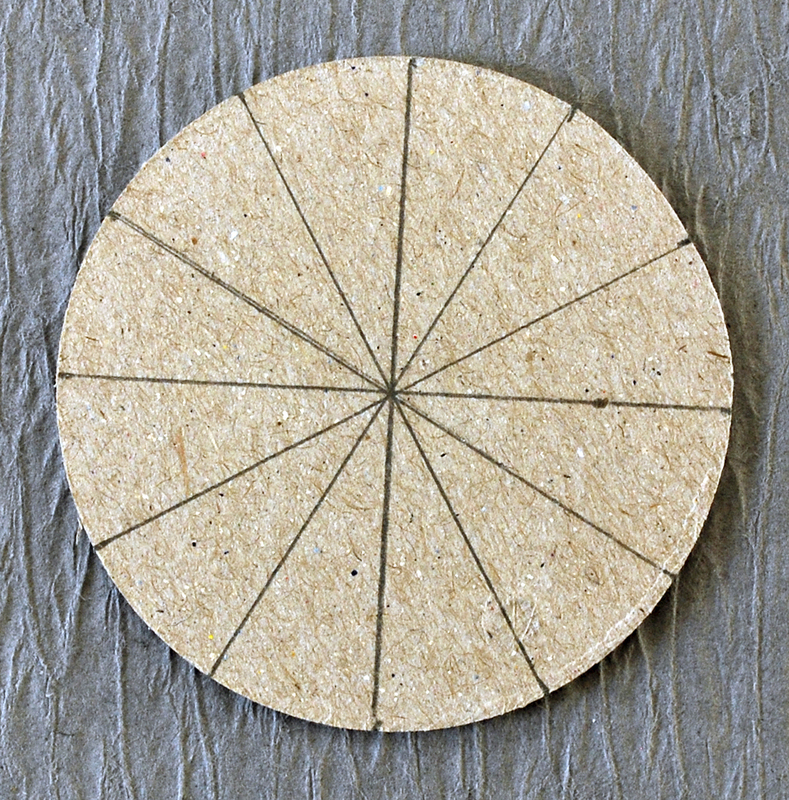 Cut two identical chipboard circles ~ I used 2 inch circles cut on the AccuCut machine at my LSS. They could also be traced and cut with scissors. Don't worry if your circles aren't exactly perfect. The petals aren't going to be exactly the same even with perfect circles. ***Update*** I have created 3 different size looms for my personal use: small ~ 1 1/2 inch diameter, medium ~ 2 inch diameter, and large ~ 3 inch diameter. Step 2. 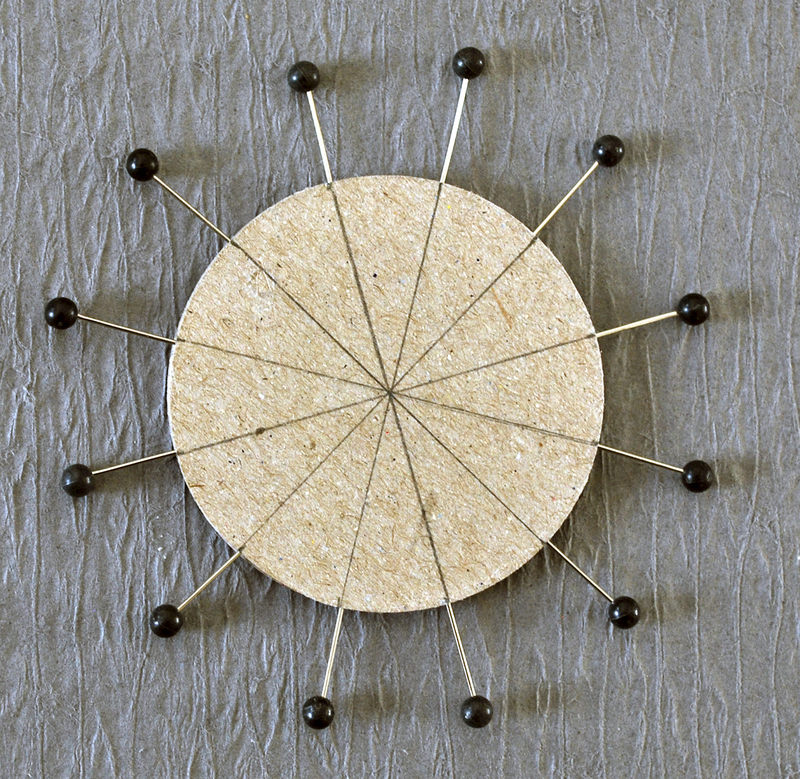 Draw 6 lines evenly spaced on the front of one circle ~ This will give spacing like the numbers on a clock. Step 3. 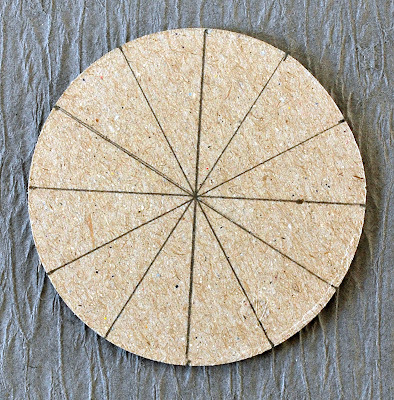 Spread glue on the back of the circle you drew lines on and adhere to the other chipboard circle. ***Note*** My loom has held up well. I've made over 20 flowers, and the pins are still nice and tight. ***Update*** ~ I have now made many dozens of flowers on my looms. After this heavy use, they started coming apart. I simply removed the pins, squeezed glue between the layers where needed, wiped off the excess glue, layered between wax paper, stacked some books on top and let dry over night. The next morning it was nearly as good as new. I could have easily made another, but saved the time of marking my lines for the pin placement. ***Note*** I have created a Twine Length Guideline Chart which can be found at the bottom of the page. Step 1. At first you will be working from your spool of twine. Don't cut anything yet. Think of your loom like a clock. Leaving about a 4 inch tail, hold the twine at 7:00. 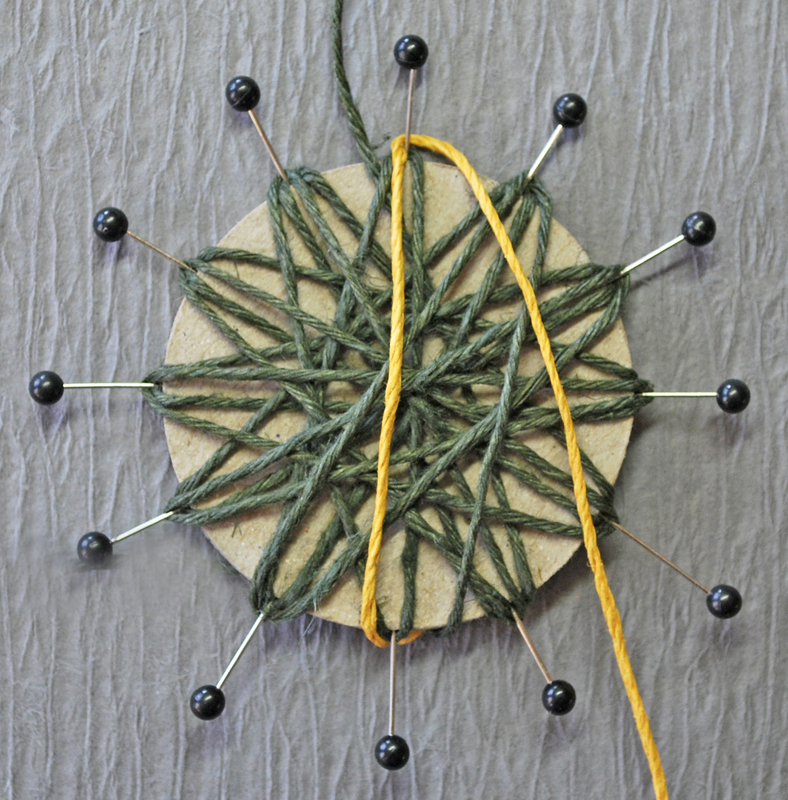 Wrap the twine up to the left side of the pin at 12:00 and wrap over and behind the 12:00 pin, moving from left to right, then wrap straight down to the right side of the pin at 6:00. Wrap the twine behind the 6:00 pin from right to left. ***Update*** You can precut twine and cording using my new Twine Length Guideline Chart at the bottom of this post. Be sure to read my suggestions below the chart. Step 2. 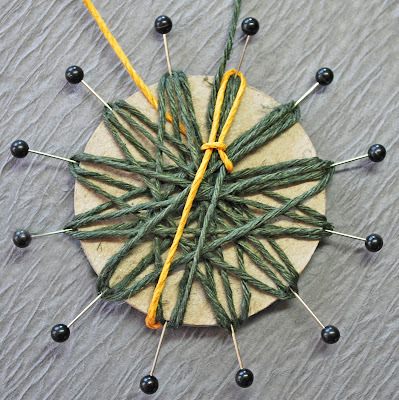 Now wrap your twine back up to the left side of the 11:00 pin, wrapping over/behind the pin from left to right and straight down to the right side of the 5:00 pin, wrapping behind the 5:00 pin from right to left. Step 3. 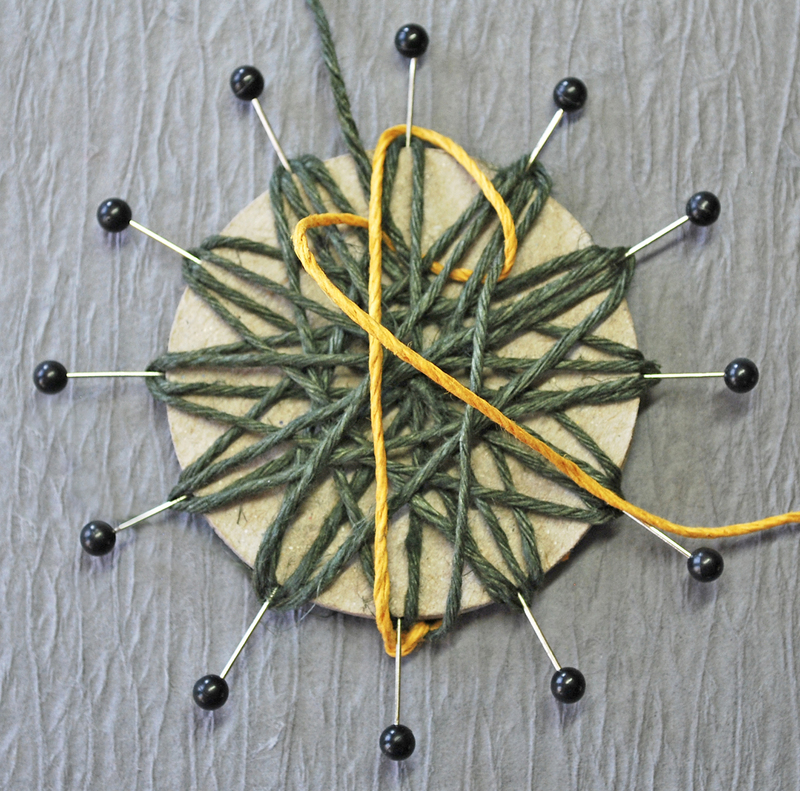 Continue this pattern until you have one loop around each pin. Step 4. Continue wrapping around the pins in the same pattern until you have two loops around each pin. Step 5. This was the confusing part for me, so I changed out the twine to a contrasting color to help illustrate the remaining steps. Your final wrap will be back around the 7:00 pin where you started. My loom is rotated in the photo, so it is no longer in the 7:00 position, but this last wrap goes around the pin that was in the 7:00 position when you started wrapping. You will leave the starting tail at the 7:00 pin. On the working end of your twine, cut about a 20 inch length of twine. That's 20 inches from the last wrap on the loom. 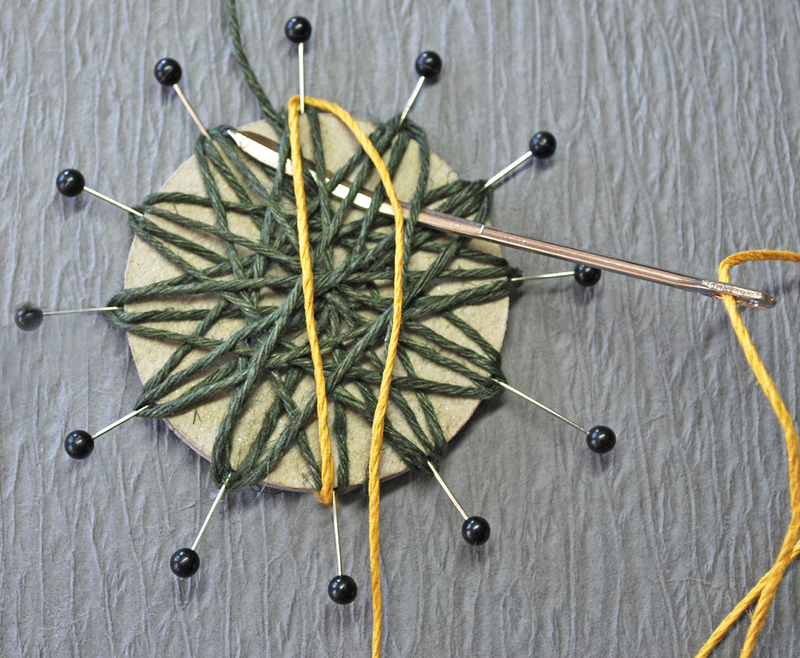 The amount of twine needed will depend on the thickness of the twine you are using. A thicker twine will require more and a thinner twine would require less. The twine I used is about the thickness of bakers twine. 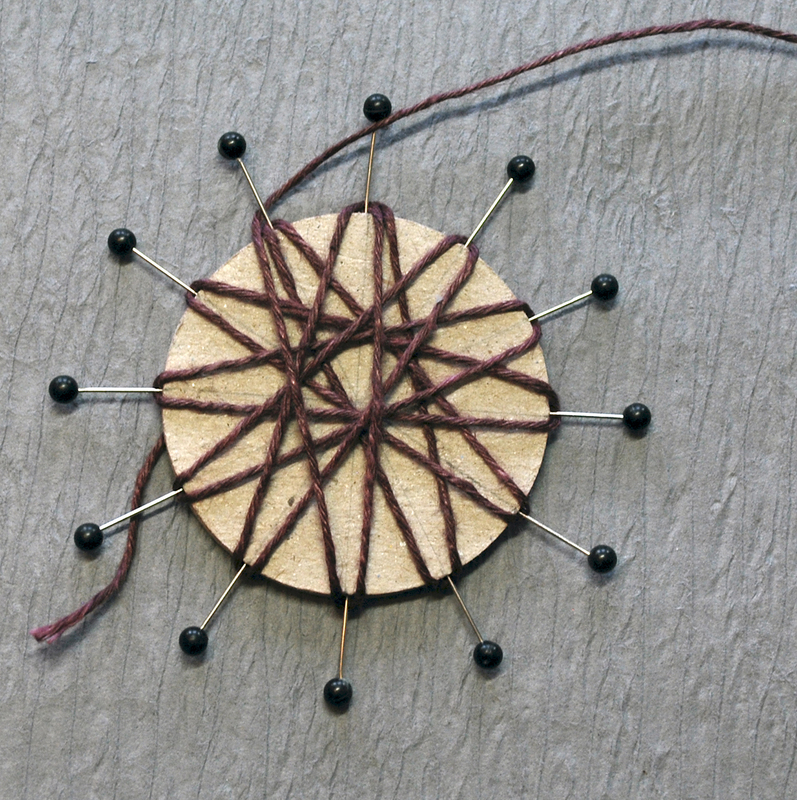 I also made a flower with a thicker jute which you can see in the photo at the end of this tutorial. That twine required about 24 inches to do the center weaving in the flower. When it doubt, cut a longer piece that you think you might need and then you will know how much to cut for your next flower. I keep my scraps to use on other projects like the ties for tags. Thread the twine onto your large needle. Step 6. Now you are going to start weaving around the center of the flower. This will secure the flower petals in place and give the decorative stitching around the flower center. You are working from the back of the flower, so you won't see the pretty decorative stitching until the end when you remove your flower from the loom and turn it over. Move your 7:00 pin so it is now at 12:00. You will start weaving behing the "petal" to the right of your final wrap. 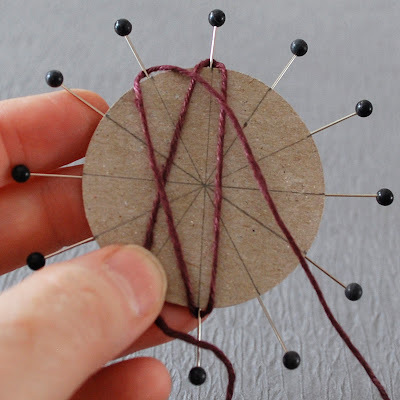 So, take your needle and go underneath the 4 strands of twine wrapped around the 1:00 pin and push the needle all the way behind the 5 strands at the 12:00 pin, (the 4 petal strands and your starting strand of twine - this is the only place there will be 5 strands of twine.) 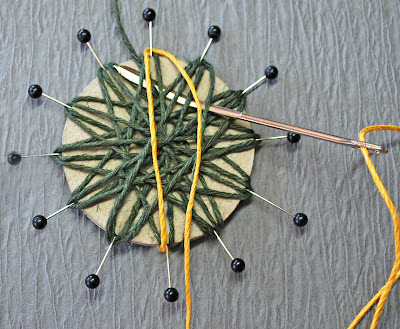 As you can see on the photo, your needle will be under a total of 9 strands of twine. Step 7. Pull your needle through. 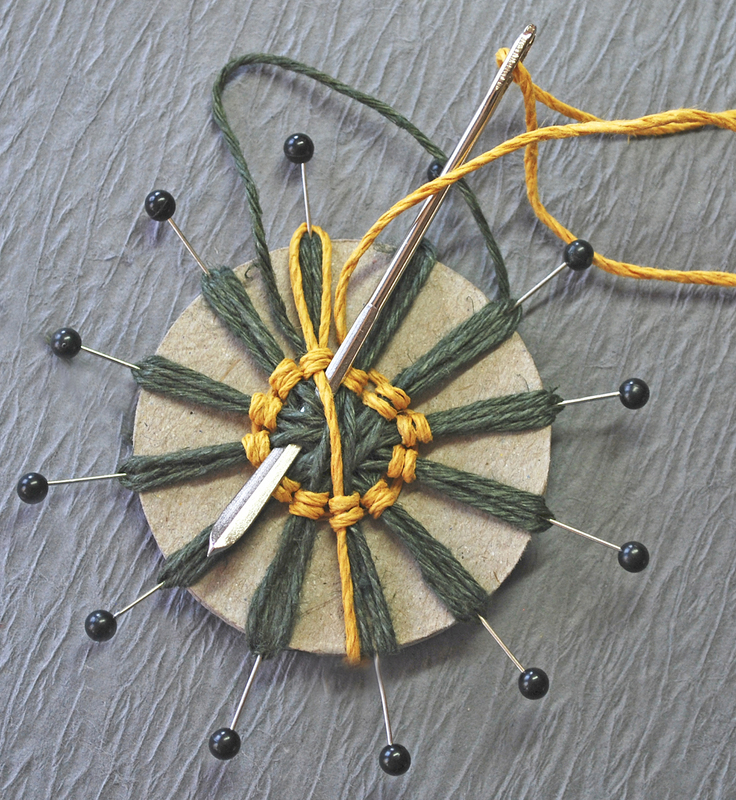 For this weaving stitch only leave a little slack in the end of your twine. Notice what the yellow twine is doing. 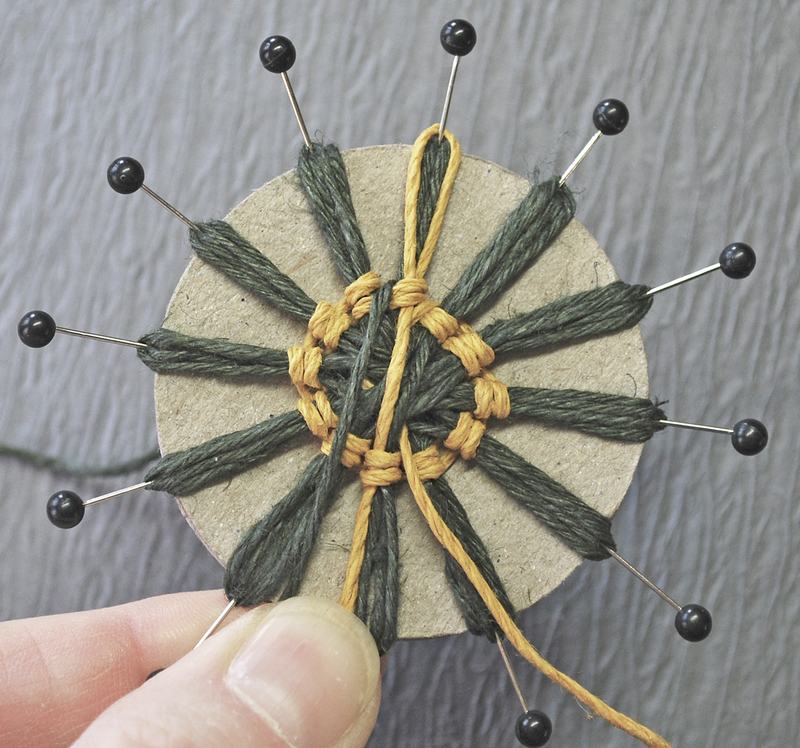 The last wrap around the pin is now at the 12:00 position only goes to the center of the flower, so when you take your next weaving stitch with your needle you will secure that half thread in place. Moving to your left, push the needle under all 4 strands of the 12:00 petal plus starting tail and keep pushing it under the 4 strands of the 11:00 petal. Step 8. 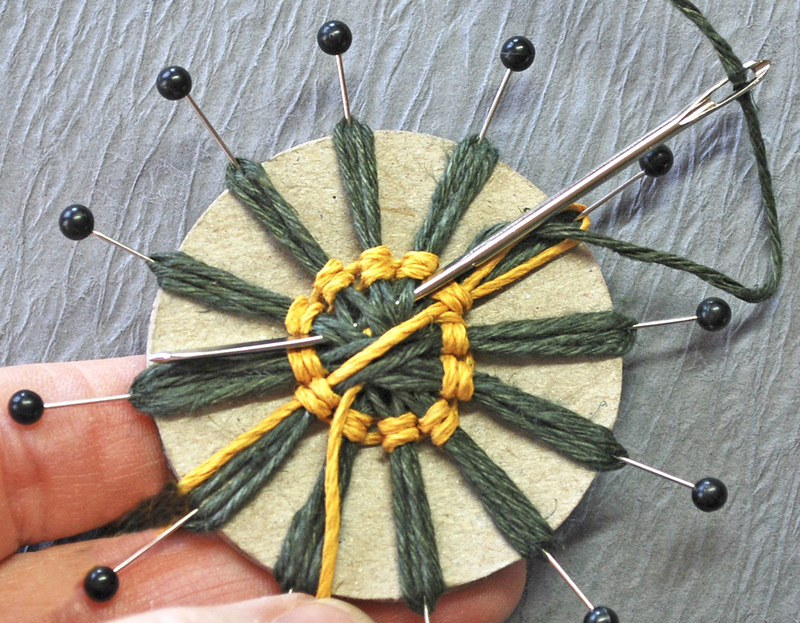 Pull your woven stitches tight, pushing them towards the center of the flower with the tip of your needle. 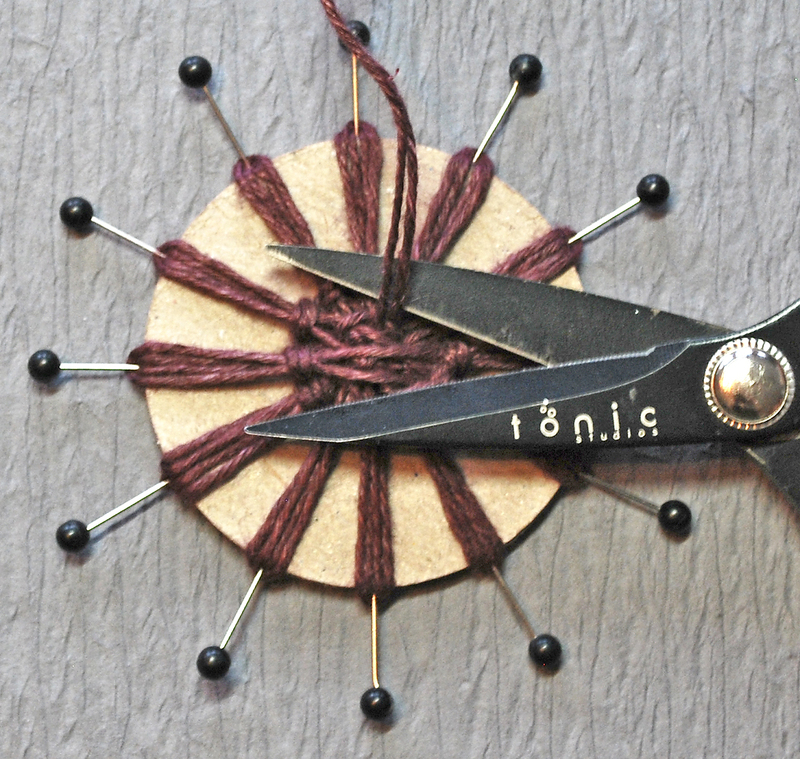 This is the only place where you may need to work with your stitches a little bit to get them nice and tight. Sometimes after I pull the stitches tight, the first stitch is too loose, if that is the case, I use my fingers to pull on the second stitch to take the slack out of the first stitch. 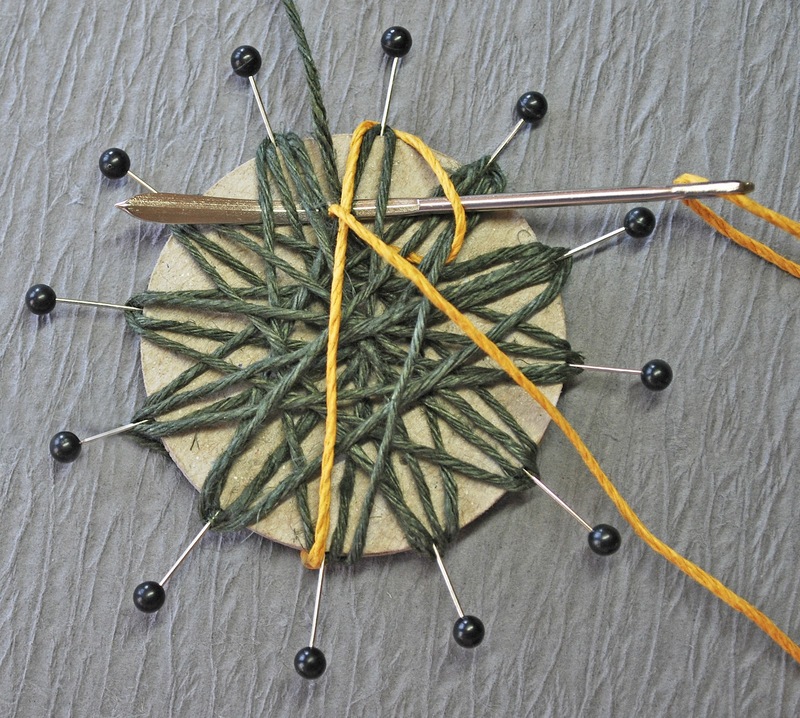 Your stitching should look like the stitches in the photo below. Step 9. 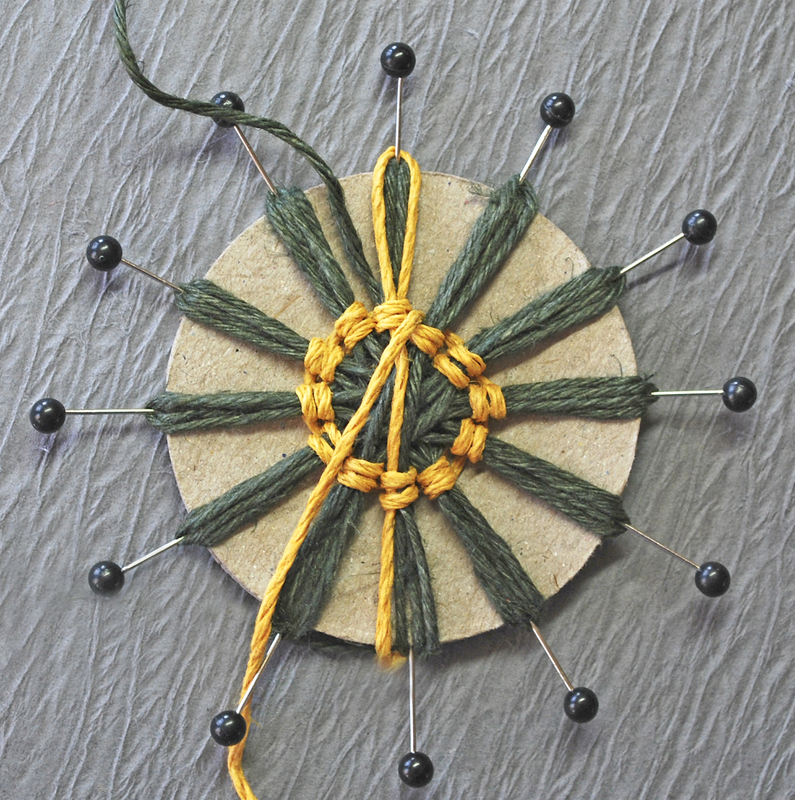 Continue weaving by stitching under the petals, moving to the left in a counter clockwise direction. 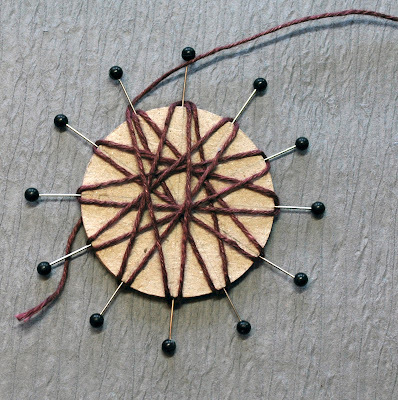 Please note, now that you are past the starting tail at the 12:00 petal, you will continue going behind two petals each time, but now for a total of 8 strands of twine. Step 10. Continue this pattern until you have 2 stitches around each petal, coming back around to where you started. 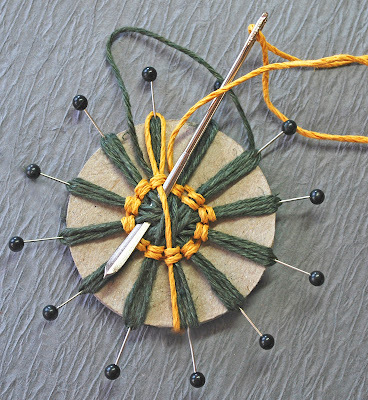 Your last weaving stitch will still go behind 2 petals ~ 8 strands of twine. 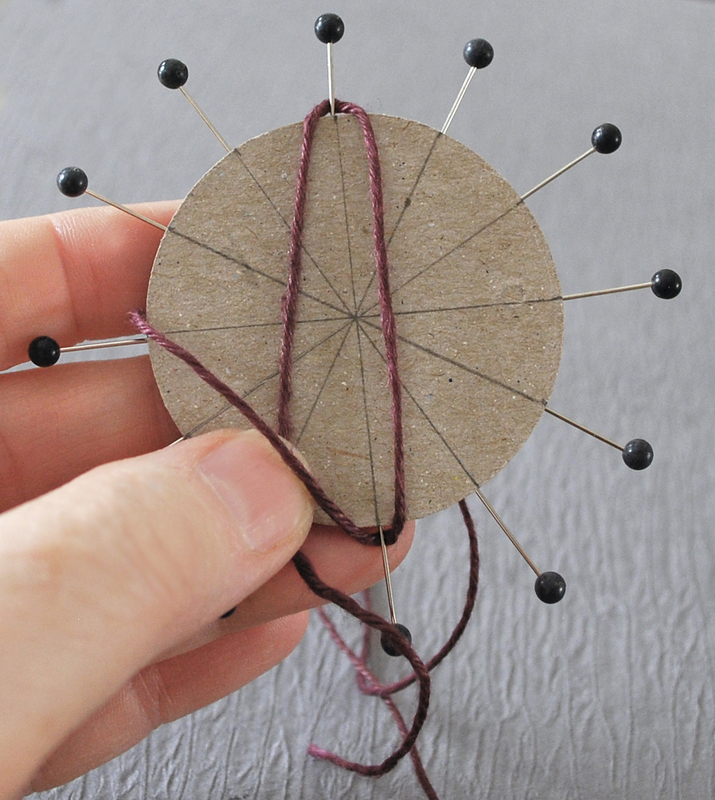 Pull the working twine on your needle down between the petals and between the stitches to the center of the flower. Step 11. 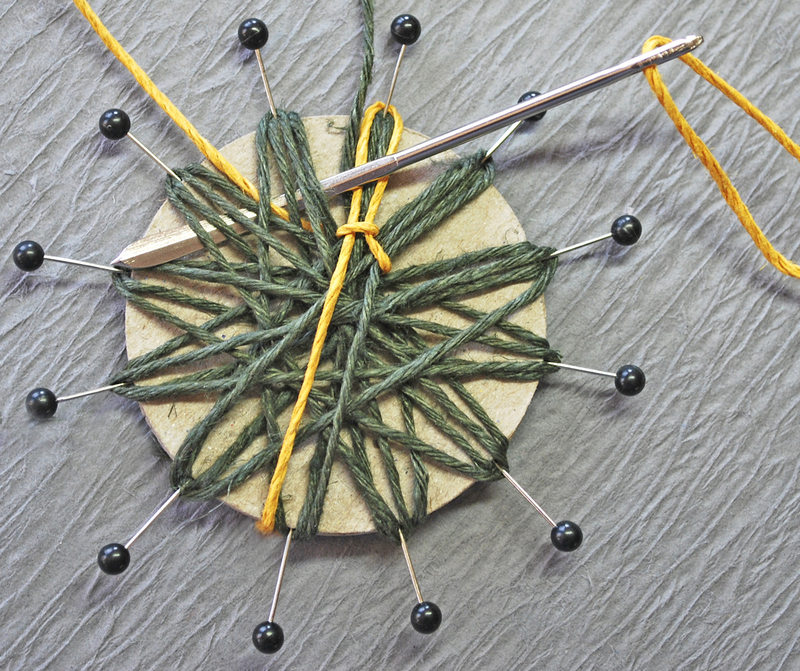 Use your needle to weave the end of the thread under the top layer on the center stitches until it seems secure. I take two to three stitches to secure, usually going under about 10 or so threads all together. I start the needle under a thread that is right where I am pulling the thread between the petals and stitching so I don't distort the woven design on the back side of the stitching, which will actually be the front of the flower. After weaving the end of the twine to secure, cut it close to where it is exiting the flower center. Step 12. 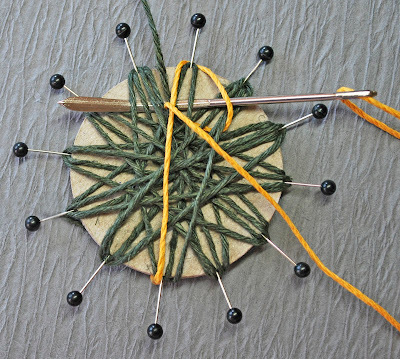 Pull the starting twine to the center and secure it in the same way. Step 13. To release the flower from the loom, pull the pins out one at a time to release each petal, then put the pin back in place to be ready to create your next flower. 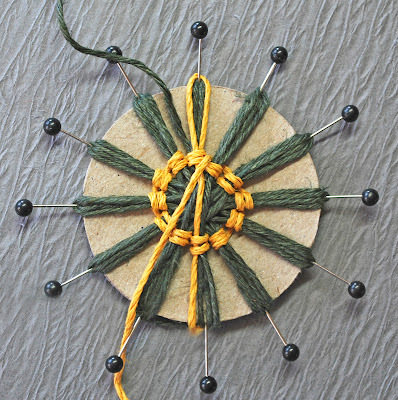 Turn your flower over to admire the beautifully stitched border around your center. ***Update*** After removing the flower from the loom, your petals will be kind of pointy and the petals will be in pairs of two. I gently round and shape the petals and gently tug on each pair, pulling one petal to the left and the other to the right, to separate them a little. Please note, if you pull on the petals too hard, you will make those ones larger and the petals on the opposite side will get smaller. You have to tug rather firmly for this to occur, but it can happen. 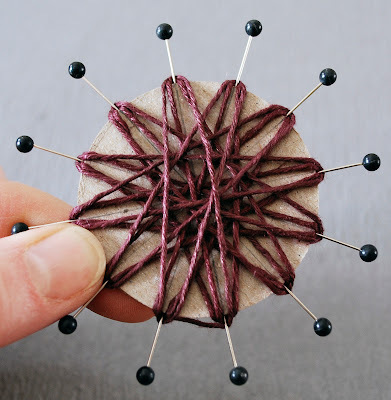 You can change the size of your flowers by using different size circles, but keep in mind that the center of your flower will be determined by the thickness of your twine, and will stay the same regardless of what size circle you use. You can see that my jute flower has a much larger center than the twine flowers. You can also dress your flowers up with a variety of different centers from gems or large pearls, to Bonnie's Candi Mini's or buttons. I have created a twine length chart for you to used to determine approximately how many flowers you can create with a length or spool of twine. I highly recommend purchasing spools. These flowers are addicting and it's hard to stop making them once you start!! If using this chart to precut your twine, please read my suggestion below the chart. ***Suggestion*** This chart can also be used to precut your twine; however, I suggest adding several inches the first time you try a new size. I wrap fairly tightly, so if you wrap and weave more loosely, you may require more twine than I do. 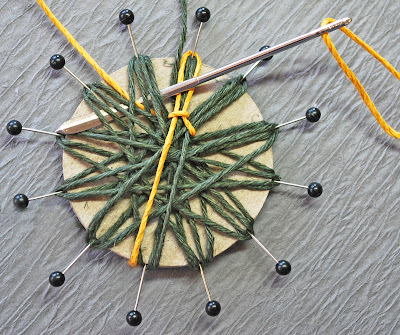 You can measure your excess twine after weaving in your ends and adjust your personal chart accordingly. I hope you give these flowers a try. 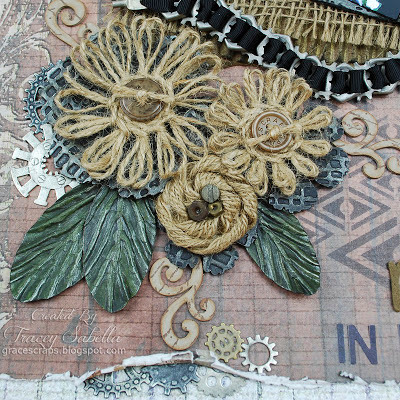 If you post a project with twine flowers using this tutorial, please stop by my blog, Garden of Grace, and let me know. These are just FANTASTIC Tracey!! 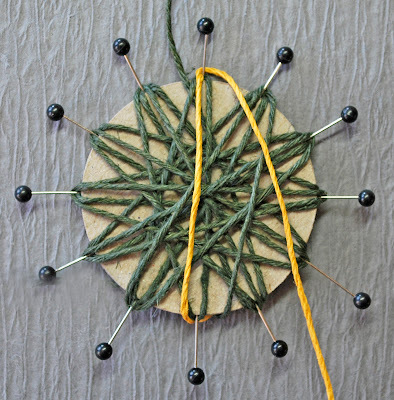 Great tutorial and I love all the different looks you can get using different types and weights of cording. I will be trying these soon!!! Yes these are really cool and soo easy to make. The loom is almost the same as Becca Feeken made last year with a small round wodden box, and showed just with different types of ribbons on her blog too, so I have made loads of these in many kinds of ribbons, and they do look really great on cards and projects. Wow, this is just so cool!! LOVE how your flowers look~! 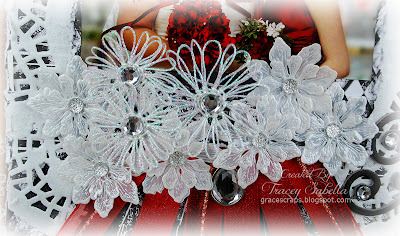 WOW Tracey, I absolutely LOVE your twine flowers, they turned out BEAUTIFUL!!!! Thank you for sharing!!! Beautiful card too hun!! I love making my own flowers - saves me money and looking for the perfect coordinating color. This looks just beautiful - delicate and mail-able! :) Thanks so much! Awesome flowers! I'm going to save this tutorial page so I can try it. Thanks for sharing! These are amazing! I can't wait to try them. Thanx so much for sharing! Love all the updates you added to this post. Thanks for the tutorial. Off to try it out. Thanks for this wonderful tutorial, I have just made three wonderful flowers. Bright and Happy Birthday Tag!